This recipe is the Gutsy Gourmet's version of a most popular Mediterranean and Middle Eastern dish. It is a Middle Eastern version of lasagna without the pasta. Layers of meat and vegetables with a glorious Bèchamel sauce. And of course the star ingredient of this dish is eggplant. This is probably the most famous of all eggplant dishes. It is the national dish of Greece and probably the number one comfort food of the Middle East. 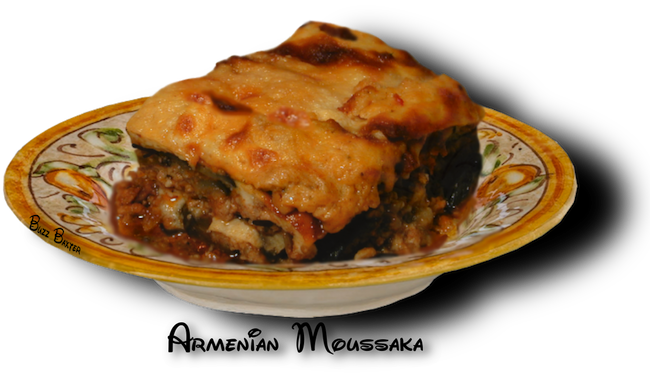 It is the showcase recipe for utilizing the wonderful flavor of eggplant paired with a variety of ingredients. and let rest for an hour to leech out the bitter liquid. Pat dry with paper towels. you might need a bit more oil. Set aside for later assembly. simmer,  covered, for 30 minutes. nutmeg and cinnamon and ½ the Parmigiano-Reggiano cheese,  the salt and pepper for taste. Cover the saucepan and set aside. 1. Liberally coat a baking or casserole dish with olive oil. a. Place a layer of fried eggplant on the bottom. b. Top the eggplant with ½ of the meat sauce. h.   Sprinkle on top with the remaining Parmigiano-Reggiano cheese. i. Cut into squares and serve.